Great job, dropped the car in for simple headlight replacements. Was resolved quickly and respectfully. My tire blew on the way to work and I was very panicked. I drove right to Green and Ross and got great service from both Emile (at the front counter) and Danny who fixed my tire. My tire was fixed right away and I was given very good service. Great job, service and cost, that's why I keep coming back. Long time and always satisfied customer. Leo Chen recognized the urgency of my situation when I needed to replace my tires due to a flat tire (they were already 5 years old and needed replacing anyway) and had it done immediately just before closing time on a friday night. 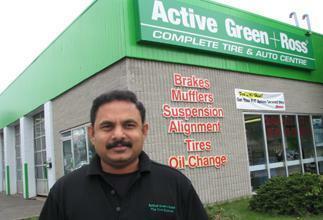 Excellent professional service every time I go there I am impressed. They suggested the best tires for my car for my budget and also changed them after the winter putting them back in the bag for easy storage. Car runs great.